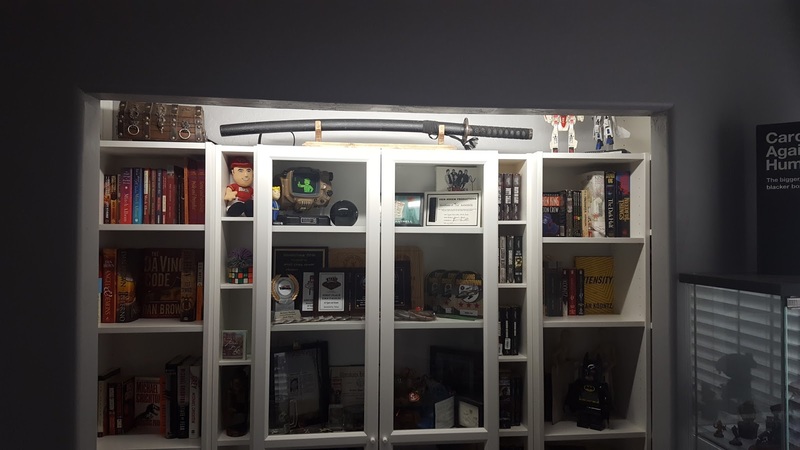 In Part 1 of this 3 part series I discussed the remodel of an unused den space into my new hobby room. 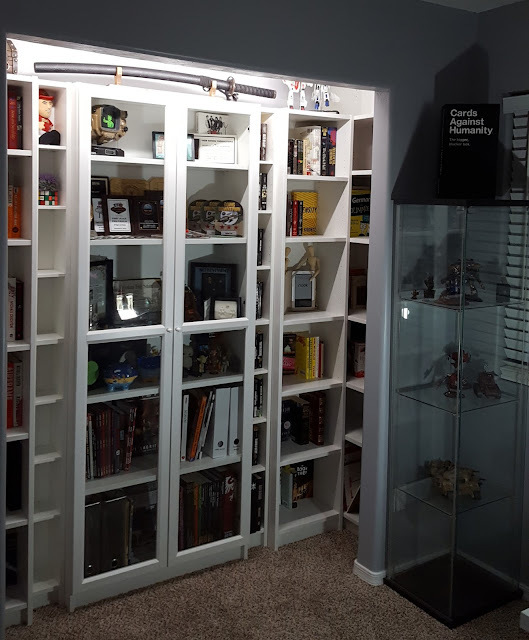 In this part I'll show you my design and process for constructing a custom bookshelf/display cabinet from Ikea Billy bookcases. The closet in my new hobby room is rather long an narrow. Approximately 8 feet wide by 2 feet deep. 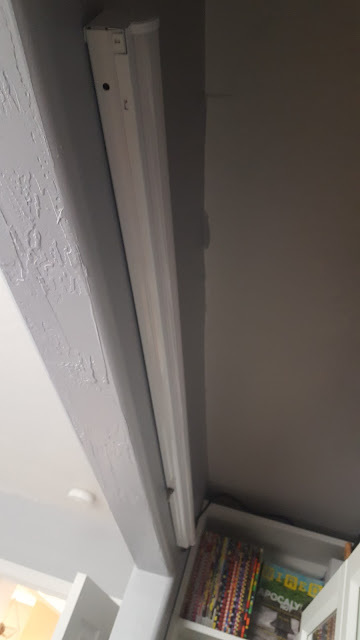 I didn't want the typical long closet doors blocking off it's contents. I find those doors to be a rather dull use of space. I decided that keeping the closet open to the rest of the room and lining it with bookcases would be a much more productive use of the space. I began the design of my new hobby room in SketchUp. The software is a free CAD program from Google. Sure there is a premium version but for most users the free version is plenty. The first step was to lay out the dimensions of the room. Once I had the floor plan in place I locked that layer and began placing the furniture. Fortunately much of the Ikea catalog can be found in the SketchUp 3D Warehouse but for those items not available it isn't too difficult to draw your own. The Ikea website provides ample descriptions to many products on their website. During the first 3 days of November Ikea was offering free delivery and a jumped on the chance. Upon delivery I had to determine an order of operations to my installation and customization. I knew what the measurements should be based on my model in Sketchup but walls are rarely ever perfectly square or even level so I was sure to encounter some variation. 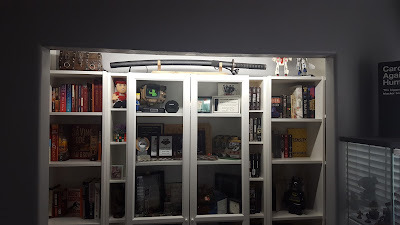 I began by building the center bookcase and mounted it to the wall on center. I decided that next I would have to build from the outsides in. I started with the right side. I began be remeasuring the nook in which I would be placing the 31 1/4" bookcase. I noted that the width of the space was approximately 23 1/2". 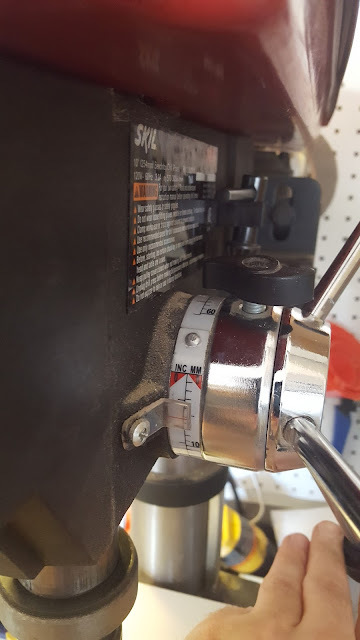 Could I modify both of the side shelves in one batch? It would save a great deal of time. I measured the other side. 24" even. I framed the closet so I only have myself to blame. I had to do these one at a time. I set up my table saw and cut all the center pieces of the shelf to length so that the fully assembled bookcase measured 23 1/2" wide. My next difficulty was going to be in assembling the bookshelves. As most of us know Ikea furniture comes with easy to assemble hardware which, in this case, means cam locks and wooden dowels. 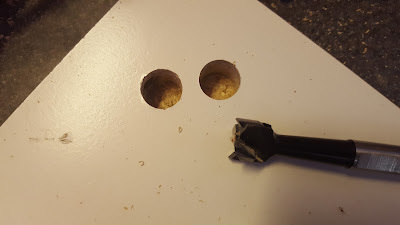 I had, of course, just cut half of the pre-drilled holes off of the shelves when I narrowed the pieces. To re-drill the flush cut holes that the cam locks plug into I used a 15mm forstner bit. I picked mine up on Amazon. 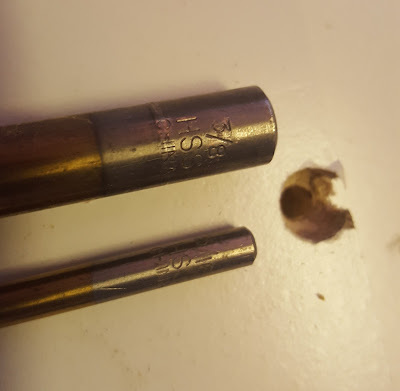 I should also note here that to re-drill the cam lock holes on the Gnedby you will need a 1/2" forstner bit. I got both of mine of Amazon for less than $10 each, you could probably pickup a set of several for that price but I didn't realize I needed two different sizes until I had already received the first one. To make sure the holes were drilled properly I set up a jig on my drill press. 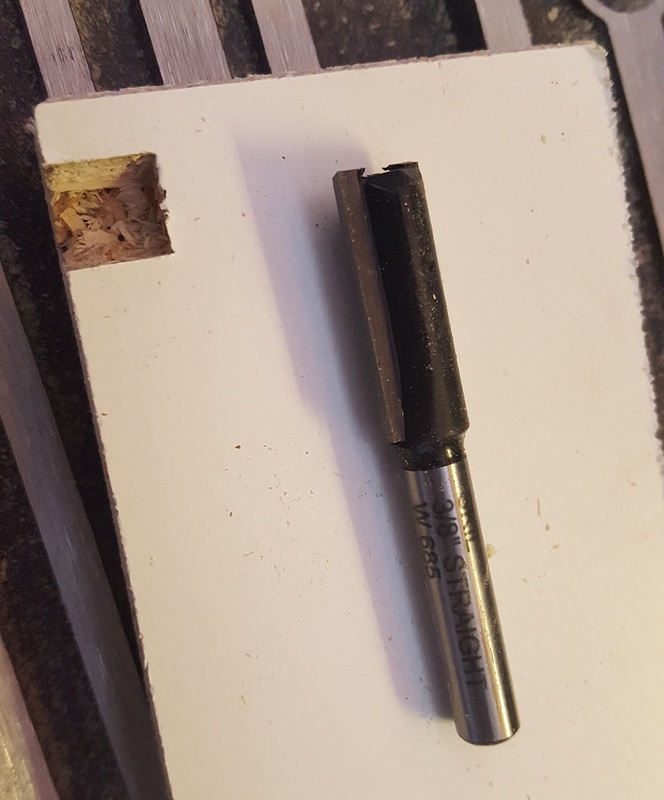 Forstner bits make nice clean flush cut holes. I used the above piece of scrap to test my first attempt. I used the extra length I had cut off the shelves to align my jig and set the proper depth of my drill bits. Make sure you set your depth gauge! The last thing you want is to punch a hole clean through your shelf. I couldn't afford to make any mistakes so all first cuts and holes were made on scrap pieces of wood. The Billy Bookcase shelves don't simply sit atop brackets, they use fasteners which insert into the bookcase walls on the horizontal but into the shelves vertically. 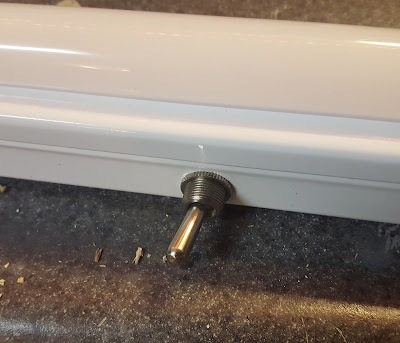 The fasteners are somewhat conical in shape and the holes they insert into have two different diameters. 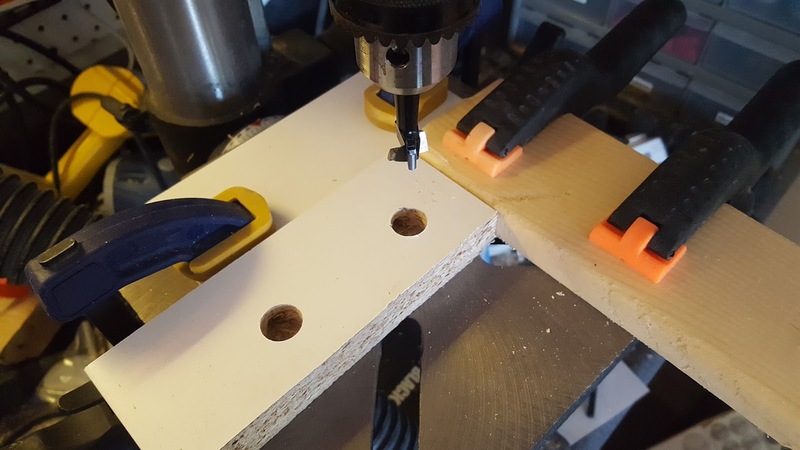 I setup a jig on my drill press for these and used a 3/8" bit and a 3/16" bit to recreate the original holes. Once this was completed I assembled the first of the two bookcases which would line the sides of the closet. I was pleased to find that it went together as if I had just removed it from the box. It was also a perfect fit for the space. I then ran an extension cord up the back of the wall behind the next set of bookcases. Then I assembled the 15 3/4" wide bookcase and mounted that against the back right wall flush with both the wall and the modified bookcase. I repeated the process on the left and then measured the space left between the center bookcase and the 15 3/4" cases. I was again pleased to find that all my measuring paid off. The space between was 5 3/4" on each side. Now I went about narrowing the Gnedby shelves. This proved a bit easier as I had already developed a process and could tackle both units at the same time. 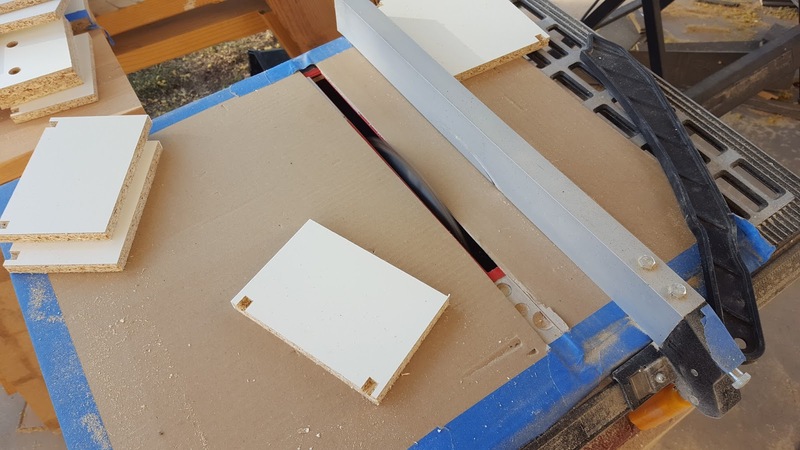 I returned to the table saw and ripped all the horizontal components down to the appropriate width. Above I'm cutting all the horizontal pieces of the Gnedby shelves to the proper width. After all the cuts were made it was off to the drill press to re-drill the holes for all the mounting hardware and dowels. 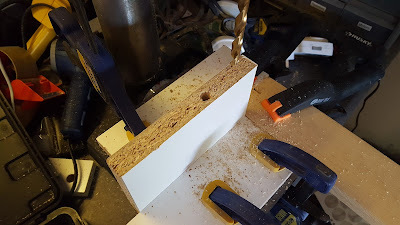 Because the shelves for the Gnedby were so narrow I was able to use my drill press for all of these holes. The adjustable shelves of the Gnedby use round pegs in the side walls which set into half cylinder recesses in the shelves. I used a 3/8" bit on my router table to reproduce these notches. Once that was finished I assembled the Gnedby shelves and mounted them into place. They are more shallow than the Billy bookcases so I mounted them slightly set back from the Billy bookcases for a more pleasing appearance. Now that the bookcases were in place it was time for a bit of lighting. 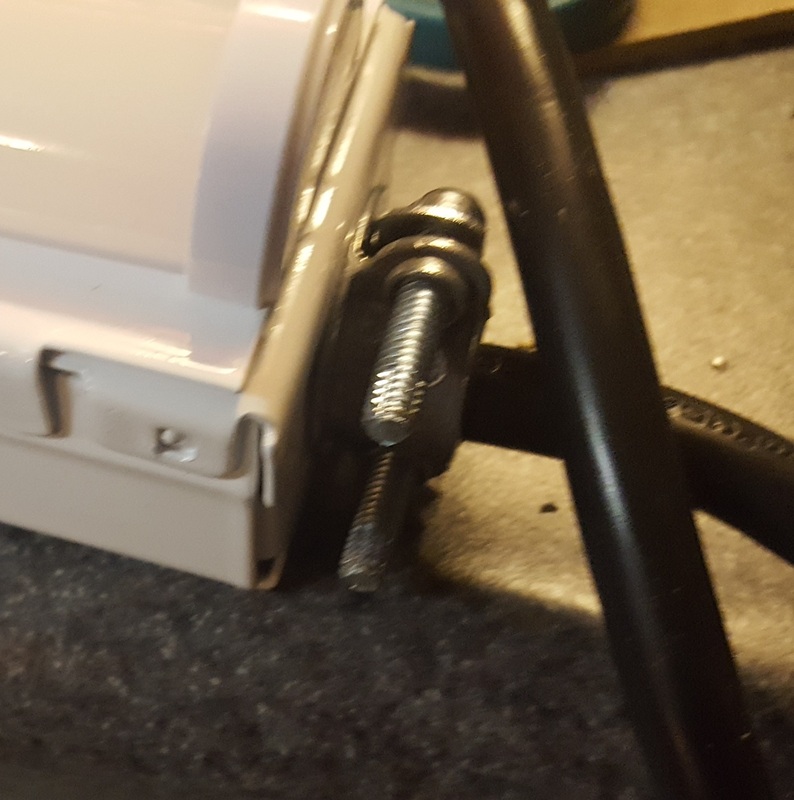 I purchases a flush mount LED light strip and a grounded lamp cord from Home Depot. I then wired up the light, installed a toggle switch, and mounted it to the back side of the front closet wall. A 20A 125V toggle switch I salvaged from some appliance many moons ago. An inexpensive lamp cord can be used to turn in a hardwired lighting fixture into a plugin lamp quite easily. In the end it all turned out quite a bit better than I expected. In Part 3 of this series I will cover my custom hobby desk also assembled from Ikea furnishings.